No one's ever gonna love Florida Georgia Line more than God, your mama and Backstreet Boys. Sunday night's 2017 ACM Awards promised to bring about some unforgettable music collaborations. But perhaps the one that grabbed the attention of country music and pop music fans alike was this special dynamic. During tonight's live broadcast held at the T-Mobile Arena in Las Vegas, Tyler Hubbard and Brian Kelly took to the stage to perform their big hit titled "God, Your Mama and Me." But in a collaboration you don't exactly see every show, BSB members including Nick Carter, Kevin Richardson, AJ McLean, Brian Littrell and Howie Dorough decided to join the party and sing "Everybody (Backstreet's Back)." During the set, Carrie Underwood couldn't stop singing every word while Tim McGraw was blown away by the group's dance moves. Dare we say it was larger than life? The performance comes as the Backstreet Boys continue their Las Vegas residency at the AXIS inside Planet Hollywood. While the guys have been selling out night after night, the group was able to enjoy a weekend off. In fact, Howie decided to attend Britney Spears' residency on Saturday night where he was asked to come on stage. "Leave it to @BritneySpears to bring out the freakshow in Howie D!" BSB wrote on Instagram with video from the must-see moment. "What happens in Vegas... #pieceofme #pieceofhowie #bsbvegas." While BSB calls Vegas their home for the coming months, Florida Georgia Line is hitting the road this summer as part of The Smooth Tour presented by Old Camp Whiskey. In fact, BSB will join them on select dates including stops at Target Field in Minneapolis, Fenway Park in Boston and Wrigley Field in Chicago. "Can't wait to party with y'all this summer!" Florida Georgia Line shared on Instagram. Brian Kelley and Tyler Hubbard of Florida Georgia Line perform with AJ McLean, Brian Littrell, and Howie D. of Backstreet Boys onstage during the 52nd Academy Of Country Music Awards at T-Mobile Arena on April 2, 2017 in Las Vegas. It was no secret that Florida Georgia Line would take the Academy of Country Music Awards stage with the Backstreet Boys Sunday night (April 2), as they were announced as co-performers prior to Sunday's show. But what the audience didn't realize was that they'd also be singing a Backstreet Boys song. After delivering a sweet rendition of their collaboration "God, Your Mama, and Me," the country duo and boy band provided perhaps one of the most electric moments in awards show history by singing "Everybody (Backstreet's Back) -- and yes, all seven of them did the iconic dance. There were some incredible performances throughout the 2017 ACMs, but it's pretty hard to deny that FGL and BSB gave the best of the night (and judging by his reaction, Tim McGraw would agree). Good thing no one had to follow that one up. 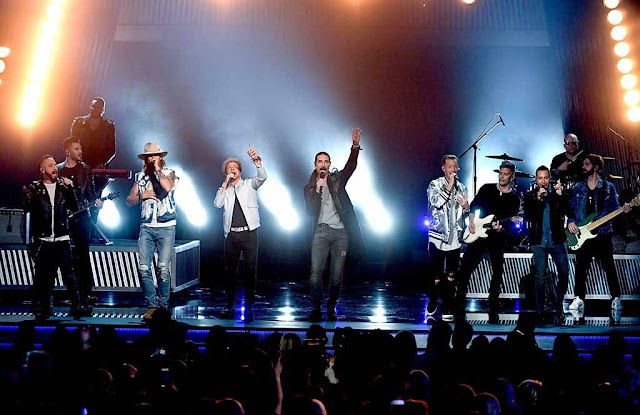 Florida Georgia Line brought a dose of Nineties nostalgia to the ACM Awards, joining forces with titans Backstreet Boys for an explosive mashup of their collaborative single "God, Your Mama and Me" and the 1997 smash "Everybody (Backstreet's Back)." Tyler Hubbard and Brian Kelley began the performance without the help of their collaborators, illuminated by simple stage lighting. When the second verse rolled around, Backstreet's Nick Carter appeared on an auxiliary stage in the arena, walking through the crowd while the remaining Backstreet Boys emerged on the stage. With echoes of Chris Stapleton's breakout CMA Awards performance with Justin Timberlake, the seven-minute collaboration transformed into an extended, energetic cover of Backstreet's massive hit "Everybody (Backstreet's Back)" that brought the audience members to their feet. Panning across T-Mobile Arena, the cameras caught Carrie Underwood enthusiastically singing along and Dustin Lynch dancing to the rhythm while the performers streamed into the audience. In the song's final moments, Hubbard and Kelley joined Backstreet Boys for a choreographed dance routine, earning a fist pump of surprise from Tim McGraw. Kelley and Hubbard entered the 52nd ACM Awards with five total nominations including Entertainer of the Year and Album of the Year for Dig Your Roots, taking home the honors for Single Record of the Year (for "H.O.L.Y.") and Vocal Event of the Year (for "May We All," with Tim McGraw). Currently in the final few dates of their Dig Your Roots Tour, FGL will launch their Smooth tour on June 2nd, which includes sold out stadium dates – the duo's first – at Chicago's Wrigley Field and Boston's Fenway Park. 0 Response to "Florida Georgia Line and Backstreet Boys Together Is the ACM Awards Collaboration You Didn't Know You Needed"